This free eBook is a guide for organizations to narrow down their options from a wide spectrum of Video-Based Learning offerings for eLearning. 1. What is driving the wider usage of Video-Based Learning? 2. Are there any challenges associated with Video-Based Learning, and how can they be offset? 1. What are Microlearning Videos, and how can you use them in corporate training? 2. Why is there a sudden buzz on Microlearning Videos? 3. Why should you invest in Microlearning Videos? 4. What are the key benefits of using Microlearning Videos? 5. What are the tips and best practices you should incorporate as you create Microlearning Videos? 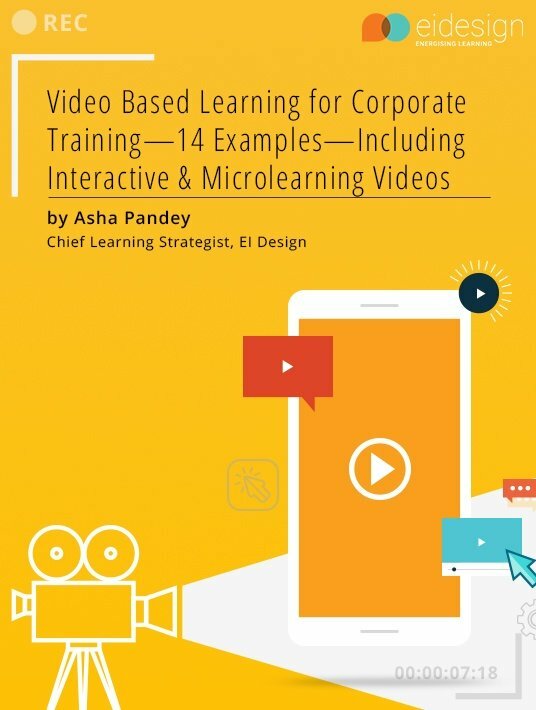 The implementation of the examples in this eBook, Video-Based Learning for Corporate Training—14 Examples—Including Interactive & Microlearning Videos, have been termed successful in creating high-impact learning experiences in areas of Formal training, Informal training, and other organizational initiatives like awareness creation programs and promotional videos. Of course you’re opting for Video-Based corporate training. This decision, though, means that a lot of preparation is needed. And the sooner you get to it, the better. The choices are countless, that’s why this comprehensive introduction by EI Design will assist you greatly. 14 examples that serve in delivering the fundamentals on Video-Based learning and Microlearning, will make things clearer and easier for you.